A DREAM YOU’LL HAVE is a curious VR app designed to give artists new to VR a quick, imaginative sample of a VR experience that is both simple and complex, and requires basic participation. The environment is meant to provide a familiar but unreal setting that toys with the users sense of perspective and space to demonstrate the creative possibilities of the medium. This was a project I developed as part of the Udacity VR Nanodegree. After playing several puzzler games from the app store, I wanted to try and build something a little more abstract and surreal while using this assignment as an excuse to teach myself 3D Modeling. Throughout the process I was able to learn a tremendous amount about movement mechanics and now feel much more confident using Maya, Tweens, and the event system. Technically and conceptually, it was interesting pushing myself to go as big as possible while trying to stay true to the concept of minimalism and simplicity. 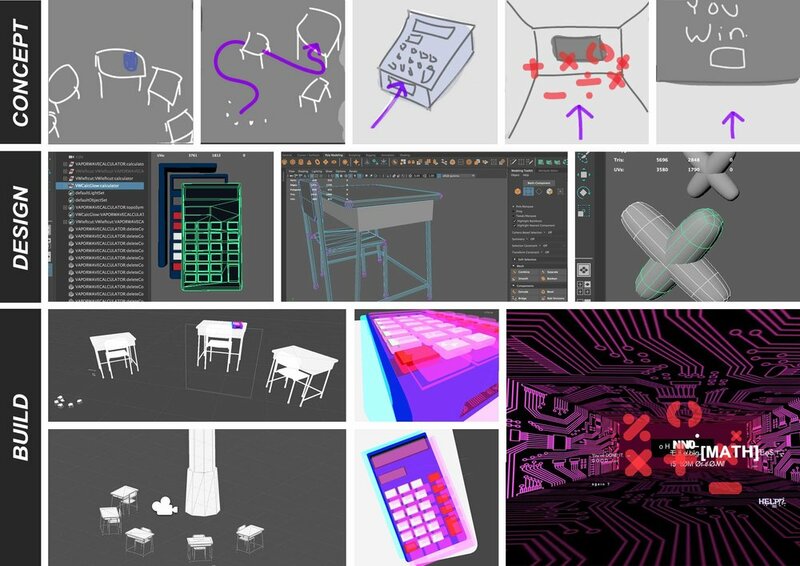 + Taught myself maya to build accurate-looking, hollow calculator with an interior the size of an average room, and also created mathematical puzzle objects. + Built average looking classroom to start, then enlarged to make calculator appear normal-sized. • Follow up: Too computationally expensive for mobile performance and crashed every test. Start over. + Revamped calculator, mathematical objects, and modified single desk asset from Argyle into simple shapes. Aesthetic: Gives a really creepy and minimal vibe - I want to know more about where the space is. Love the objects but text seems aggressive. Audio: Too strangely suspenseful with no payoff. Movement: straight-line movement doesn’t feature environment well enough. • Follow up: Make glitch text more subtle and buttons more obvious. + Revamped UI wording, added tweened text events, and outlined or animated buttons to make them stand out. Aesthetic: LOVES the minimal contemporary but retro elements, but enough to make things very interesting. Audio: Very chill - like vaporwave. Want to just listen to the soundtrack on repeat and it fits the space. Builds up excitement for something that is very simple. Would like maybe alternating audio sounds for the puzzle objects would fit the soundscape better. Movement: It’s like being on a slow tour inside an optical illusion - kind of delightful. • Follow up: Add a second sound to puzzle objects. 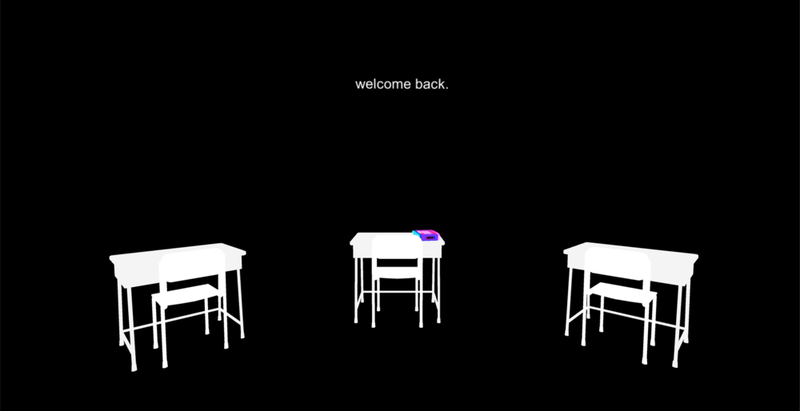 The player finds themself within a simple yet surreal environment, greeted by narrator hinting that the player has been here before. A loadscreen blurs the definition of this space as a dream, a digital environment, or both. On-rails movement reveals that objects were placed to trick the players sense of scale and perspective, and that the empty-looking environment is actually quite massive. As the player progresses, it becomes less clear whether the narrator is a sentient being slowly becoming corrupted or a program subtly-glitching into artificial intelligence. The conclusion reveals the player is trapped within a decaying, infinite loop. I learned an incredible amount from this project and really got to interact with the limitations of quality and performance first hand. But despite teaching myself 3D Modeling and movement mechanics, the biggest lesson came from user testing. Those who were familiar with technology and gaming were able to easily navigate their way through the abstract text and interfaces without a hint of difficultly, while older users who had little to no experience with gaming had trouble getting past the very first segment. Going forward I would really like to continue exploring the lines between creative, abstract experiences and UIs that are accessible to all demographics across all age ranges, and am really excited about future projects.